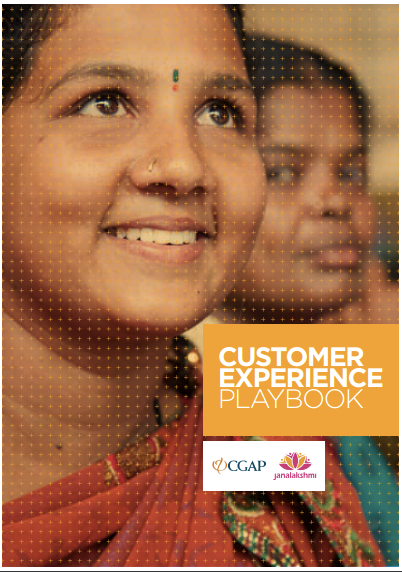 CGAP recently published a Customer Experience Playbook to help FSPs increase uptake and usage among low-income customers. Although the CX Playbook is targeted at urban clients in India, many of the lessons can be applied to the process of designing and deploying appropriate financial solutions in rural African communities as well. In collaboration with Dalberg Global Development Advisors, CGAP released a playbook to help Janalakshmi FinancialServices (Jana) in India to build a more respectful and postive customer experience. Use this playbook to learn core concepts around customer experience, gain tips on conducting immersive field research, generate solutions that are both measurable and scalable, and understand how to best institutionalize a customer-centric culture. This Playbook is meant to "be useful to the financial inclusion community at large and help promote customer-centricity at scale." Read CGAP's blog, Want to Improve Customer Experience? Here’s Your Playbook, for a summary of the research process, key learnings, and next steps of the CX Playbook. If you're looking to dive deeper, download the full playbook here.